It is becoming starker by the day that Ireland is dragging its feet in dealing with its property and debt bubble. I should say here that I don’t have a problem with the principle of kicking the can down the road or increasing debt to help those in debt; think about it, if a household or business encounters a financial shock, for example, a redundancy or bad debt, then advancing a new loan to that family or business to tide it over the shock can be a perfectly sensible solution. So if a family member is unexpectedly unemployed for six months, then rather than repossessing that family’s home, advancing a new loan to cover that family’s commitments for six months which would then be repaid when employment is restored might be a solution that works for the bank and the family. Similarly if a bank has a shock with bad loans secured on property then taking those loans and warehousing them for a period of time to allow some recovery in property prices might be also be perfectly sensible. The alternatives can be brutal, repossessing the family’s home and selling it as a distressed property or selling a distressed loan into a market at the wrong time can cause needless damage to the household or the business. There comes a time though when forbearance and special measures are counterproductive; if the unemployment persists for two years rather than six months or if the adverse market for distressed loans continues for years. At that point these special measures are just distorting markets, and preventing the efficient functioning of those markets, and because of the importance of property and banking to an economy, the efficient performance of the economy is put in jeopardy. 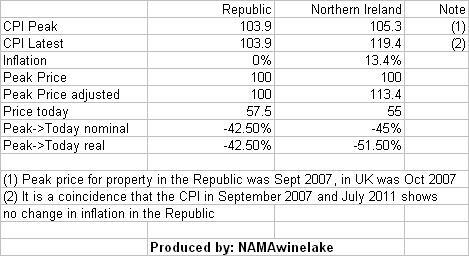 And looking at the University of Ulster quarterly house price index for the second quarter of 2011, you are reminded at how distorting the policies in the Republic in respect of debt and property have been. The report for Q2, 2011 (available here with an accompanying press release here) which is produced in association with Bank of Ireland and the Northern Ireland Housing Executive, shows that prices are still declining in Northern Ireland and are now down 45% from peak in 2007. That in itself is surprising because in the Republic, our latest house price index from the CSO for July 2011 shows that we are just 42.5% down from peak in September 2007. Remembering Northern Ireland doesn’t have the same housing oversupply issues, it has different planning authorities, banks regulated by the Bank of England rather than the Eurosystem, the pound sterling rather than the euro, governed by its local assembly with oversight from Westminster; and remembering also that Northern Ireland has an unemployment rate of just 7.7% rather than 14.4% in the Republic and has an economy which is growing albeit at a modest rate. But one of the biggest differences is inflation. Amazingly the Republic’s Consumer Price Index has remained flat since September 2007 and at 103.9 is exactly the same as July 2011. But in the UK there has been 13.3% inflation since October 2007. In real terms therefore, residential property prices in Northern Ireland have fallen 51.5% compared with just 42.5% in the Republic. Why the difference? There might be different suggestions but mine is that the bankruptcy regime in Northern Ireland sees 300 times the number of personal bankruptcies of the Republic and if you add in Individual Voluntary Arrangements the number rises to 600 times. And secondly the residential property repossession rate in the UK is six times that in the Republic even though their arrears levels are less than one third of ours. So losses on property and debt are being crystallised sooner than later. Now there is some can kicking in Northern Ireland also, as it has adopted the UK-wide code on mortgage arrears and has seen inflation stoked by the UK’s decision to print GBP 200bn in quantitative easing for its economy, but special measures have not had anything like the same effect as in the Republic – the comparison of the 52% real decline in prices in Northern Ireland versus just 43% in the Republic demonstrates that. It is also worth noting from the Universityof Ulsterreport that in the year to May 2011, there were 2,700 mortgages advanced for house purchase. There were 4,968 mortgages advanced in the Republic for the first six months of 2011. The report suggests that there has been a greater use of cash for transactions in Northern Ireland. And finally an average property in Northern Ireland costs GBP 137,814 (€156,418) which compares with a derived estimate of €180,699 in the Republic. As stated at the top, kicking the can down the road and using debt to solve a debt problem can have their places, but it seems that on the third anniversary of our disastrous bank guarantee, the distortion is continuing yet there is little immediate prospect of a recovery which would justify the special measures. Most commentators believe house prices will continue to decline, unemployment is not expected to fall substantially for a number of years, we still have a massive overhang of property, mortgage arrears continue to rise. Personal bankruptcy reform and bringing property which is presently warehoused in NAMA or the banks, onto the market will help crystallise losses so that property can find its price level and families can restart their lives. The Nationwide Building Society has this morning published its UK House Price data for August 2011. The Nationwide tends to be the first of the two UK building societies (the other being the Halifax) to produce house price data each month, it is one of the information sources referenced by NAMA’s Long Term Economic Value Regulation and is the source for the UK Residential key market data at the top of this page. The Nationwide says that the average price of a UK home is now GBP £165,914 (compared with GBP £168,731 in July 2011 and GBP £162,764 at the end of November 2009 – 30th November, 2009 is the Valuation date chosen by NAMA by reference to which it values the Current Market Values of assets underpinning NAMA loans). Prices in the UK are now 10.8%% off the peak of GBP £186,044 in October 2007. 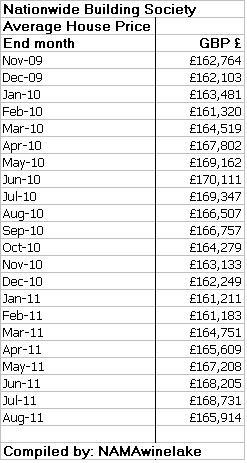 Interestingly the average house price at the end of August 2011 being GBP £165,914 (or €188,312 at GBP 1 = EUR 1.135) is 4.21% above the €180,699 implied by applying the CSO July 2011 index to the PTSB/ESRI peak prices. With the latest release from Nationwide, UK house prices have risen by 1.9%% since 30th November, 2009, the date chosen by NAMA pursuant to the section 73 of the NAMA Act by reference to which Current Market Values of assets are valued. 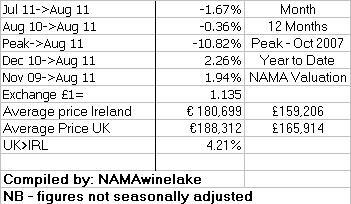 The NWL Index is now at 854 (because only an estimated 20% of NAMA property in the UK is residential and only 29% of NAMA’s property overall is in the UK) meaning that average prices of NAMA property must increase by a weighted average of 17.1% for NAMA to breakeven on a gross basis. The short-term outlook for UK residential, like the UK economy as a whole, remains bumpy. It seems as if UK interest rates will be held at historic lows for some time to come – the base rate which has been at 0.5% since February, 2009. Inflation remains above 4% per annum and is projected to finish 2011 at 4-5%. It’s worth pointing out that CPI inflation in the UK has increased by 13.3% (105.3 to 119.4) since October 2007 – the peak in house prices – no doubt as a result ofthe GBP 200bn of quantitative easing applied in the UK. Unemployment in the UK remains elevated (for it) at 7.7% – paradise compared with the 14.4% unemployment here. The UK has a 10% fiscal deficit which it is struggling to close. Mortgage lending in the UK picked up in July 2011, but a report by the Land Registry indicated a declining pattern of transactions over the past year. On a regional basis, practically all regions of theUK have seen a decline in prices in the past year, with the exception of London. Personally I am sceptical of the much-vaunted Olympics effect on London house prices – the city has a large population which is increasing with a lot of new money coming on the market and housing supply is constrained and the Olympics is unlikely to affect that basic fact one way or the other. Remember though that the UK has had 4%+ inflation for most of the past year, so real declines nationally have been more marked than the nominal headlines. So I would have said the outlook for London seems stable but that most of the rest of the UK has a choppy short term future, and even in London growth might be minimal or even negative when you strip out 5% inflation.